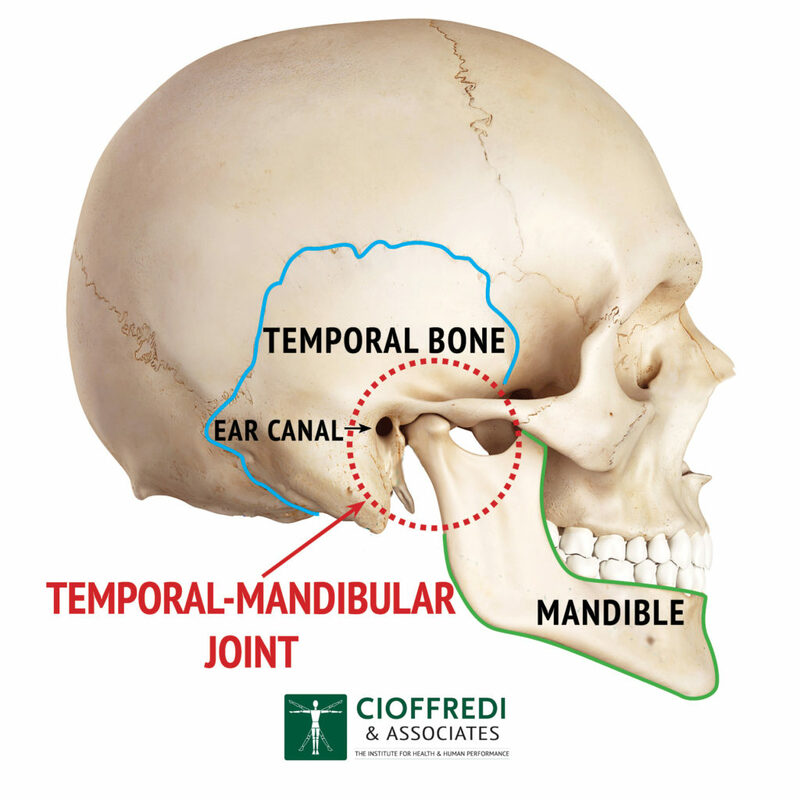 The temporomandibular joint, commonly referred to as the TMJ, is the “hinge” joint on each side of the head that allows the jaw to move smoothly up and down and side to side. Temporomandibular Disorders, or TMD, are a group of conditions relating to functional problems associated with the TMJ and muscles of the jaw. These painful disorders affect nearly 10 million Americans each year, and have been found to be more common in women than men. 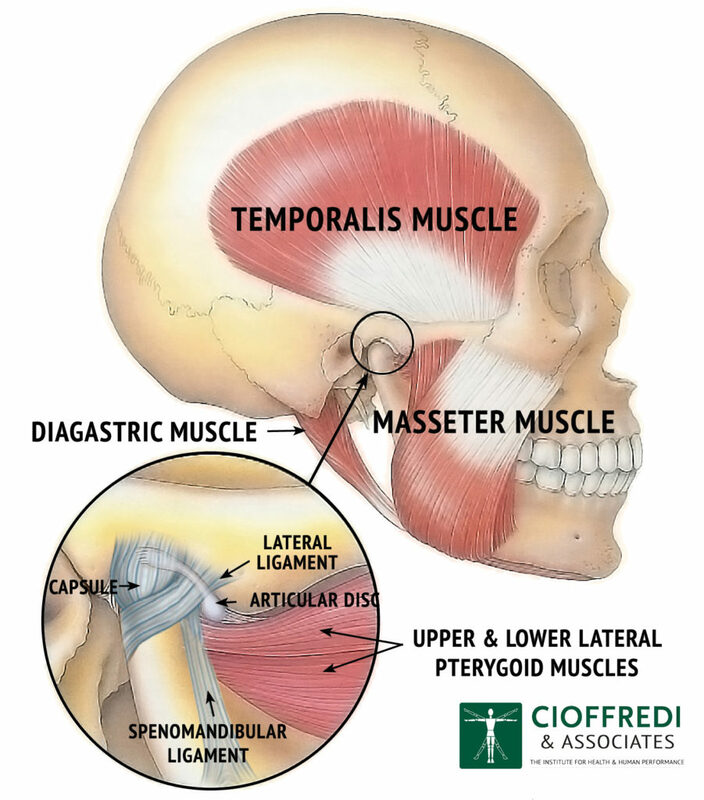 Cioffredi & Associates physical therapists are trained to treat jaw pain and TMJ disorders right here in the Upper Valley. Pain or tenderness in the face, jaw joint area, neck, and shoulders when you chew, speak, or open your mouth wide. Jaws that get “stuck” or lock in the open or closed position. 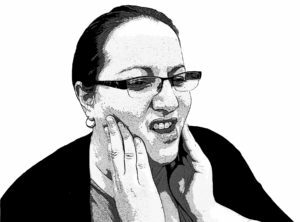 Painful clicking, popping, or grating sounds in the jaw joint when opening or closing the mouth. Other symptoms may include toothaches, headaches, neck aches, dizziness, earaches, and hearing problems. Painful TMD symptoms arise from problems with the muscles of the jaw or with the parts of the joint itself. These problems can be caused by clenching of the teeth (often caused by psychological stress, anxiety, or tension), an injury or dislocation, dental abnormalities affecting the bite, various physical stresses such as illness, poor nutrition or dehydration (especially in children), and various forms of arthritis. We have been treating craniofacial pain non-surgically since 1985. Our success in treating these conditions lies in our approach to correcting the abnormal biomechanics (motion and forces) of the region, and working cooperatively with any dental corrections or appliances. Identification and correction of abnormal biomechanics of the spine and TMJ. Manual therapy to correct joint and soft tissue mobility of the spine and TMJ. Regaining length to shortened muscles and tendons, restoring proper movement patterns and postures. Pain management with ultrasound or electric stimulation when appropriate. Education in self-management including proper posture and ergonomics both at home and at work. Clenching? Locking? Painful popping or clicking? Did you know that physical therapy can bring relief from TMJ discomfort? A few sessions—and your partnership—with a physical therapist may well be your fastest route to recovery from TMD discomfort, and during your treatment you will learn how to maintain healthy function and prevent the return of pain. Is it Necessary to Have a Referral? While a written referral is not required to seek care, it may be a requirement of your insurance company. A benefit of getting a written referral from your doctor or dentist is that it will ensure that they get a copy of your evaluation, re-evaluation, and discharge notes, so that they can keep up with your treatment progress. We are happy to provide referral forms upon request.